The snow’s just about off of the garden and the sun’s shining brightly today. Today, for the first time, I was able to walk into the backyard and down toward the garden. Hooray! There was actually green grass after the snow had melted off. I checked my daylily beds, which look okay. The garlic bed also looked in order. Of course, it’s too early for anything to be popping up yet but even seeing the beds seems like a minor miracle. 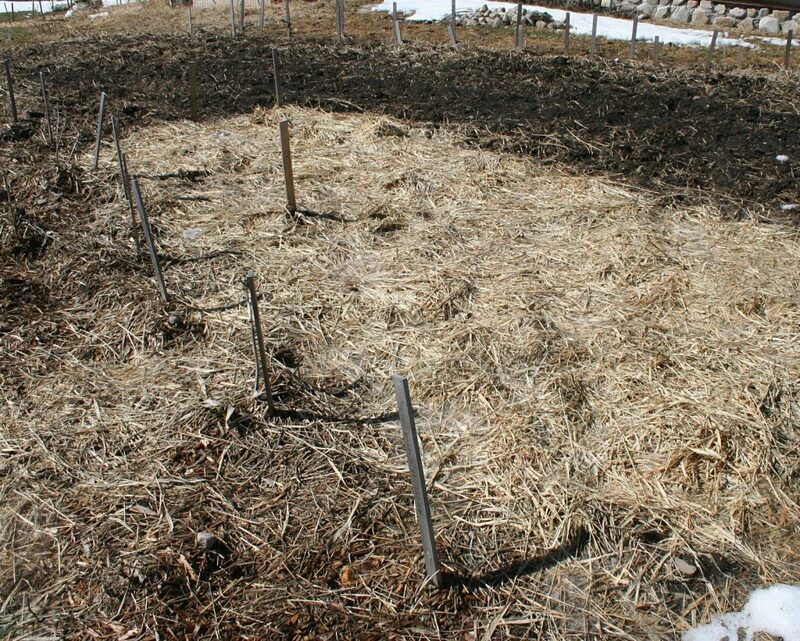 I can’t wait until the garlic starts poking noses up through the mulch into the sunshine. But when I looked at our Hansen’s bush cherries and Nanking bush cherries I was less happy. Those darned voles had been hard at work under the snow. 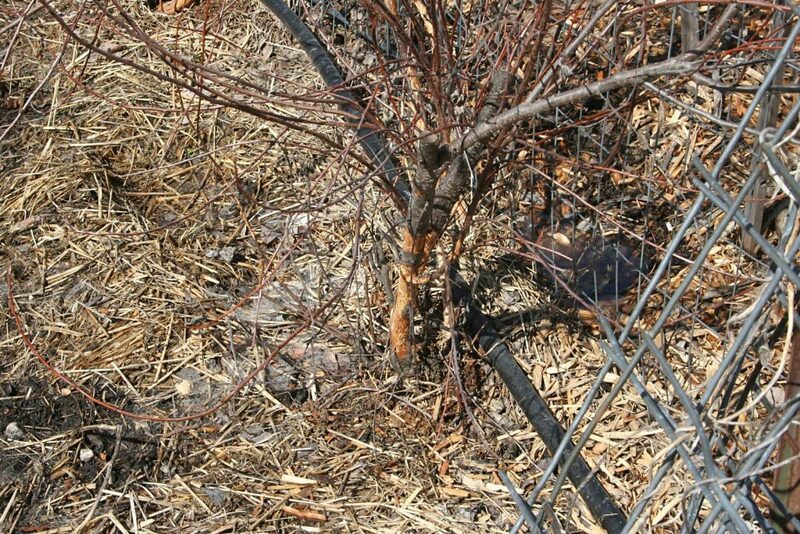 As the bush cherries don’t have a single trunk, it’s very hard to put protective screens around them to keep out the voles. And they chewed the heck out of parts of the various trunks. Will they survive? We’re not sure at this point. Most weren’t completely girdled so they may have a chance. Next fall, I’m making hardware corrals for all surviving bushes! Those darned voles were hard at work all winter. Just look at one of our Hansen’s bush cherries! I hope it will live. Will’s been getting the sawmill ready to work. He’s got plenty of lumber to cut for our barn, the new cow run-in shed for winter shelter, as well as lumber for David’s cabin. 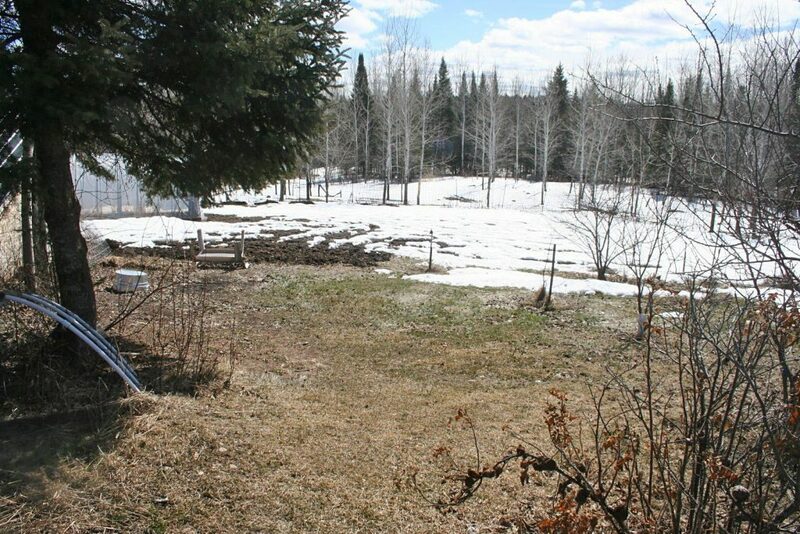 As the snow’s going away, David wants to get started as soon as he can on building. It’s amazing how fast summer goes and winter comes again! Meanwhile, I’ve been transplanting like mad. I’ve done two flats of various peppers and a flat of tomatoes so far. I’m glad I hung in there with the peppers I fried under the plastic. Many survived and look good. And the ones that died were replaced with more seeds that have now sprouted. Here’s the first flat of transplanted tomatoes, ready to sit on a shelf of one of the little plastic greenhouses in the living room. I lost a peach tree when the rabbits ate the top off when the snow drifted 4½ ft. high. I’d carefully protected the trunk so it wasn’t damaged. Sometimes you just can’t win! Yep, it seems like it sometimes. But one of my favorite sayings is “Plant until you’re planted!”. Hi Jackie – Isn’t green a beautiful thing to see in the spring?! A quick question about the Styrofoam cups. Do you poke holes in the bottom and is it easy to remove the plant. Also, will this be the last transplant before the garden or do you go to an even larger container? Yes, green IS a beautiful thing! I love it when the bright green tree leaves almost make you wince from the brightness. Yes, I poke a hole in the bottom of each cup with a sharp pencil. And, yes, it is easy to take the plant out. I just sort of squeeze the cup all around, turn it upside-down and rap the bottom. It nearly always slips right out into my hand. This is the last transplant for the year. When the weather warms I take the flats of cups out onto the deck for increasingly long times to harden them off, making them much stockier. Then when we get the garden ready, in they go, snuggled in their Wall’o Waters to protect them from surprise late spring frosts. A very happy spring to you too! We have seen 80+ here and summer will be soon. 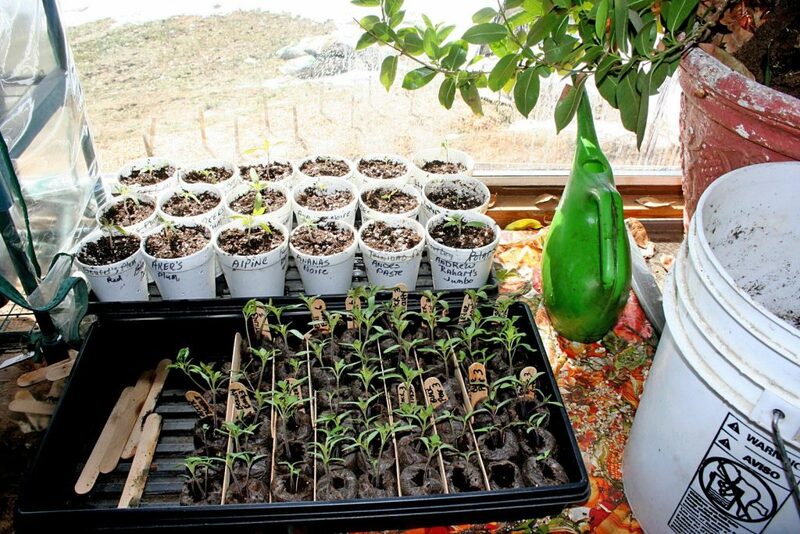 It is about time to start planting peppers and tomatoes into the garden (some would say NOW!). Tomato and pepper plants have been available to buy for a few weeks here! Of course, I garden year round (in raised beds as we are no till). We did have a few 20 degree nights this past winter but no snow. N. Central TX here. Wow, Tami! That sounds great. But I’ll bet you get a lot warmer than we do, come mid-summer…. The deer like to nibble on our apple trees about shoulder height, here in New Mexico. Spraying with Deer Off seems to keep them away. Yep, even in Montana, the deer did that….and the bucks would trash the young trees, rubbing their horns, come fall. I’m glad the Deer Off is working. Dad used to have a small apple orchard in southern Michigan and when they planted young trees they tied a nylon stocking bag with Dial hand soap on a couple of the branches of the tree which kept the deer from eating them. I’ve had the trunks girdled like that under the snow also. One way to stop it is to walk around the trees in a circle, compressing the snow and the critters under the snow will not come up out of the snow to cross the track. It is hard to do if the snow is deep, but it does work for mice. (I don’t get voles) Just tromp a circle about the drip line. Might have to wade into some snow banks, but it doesn’t cost anything! Thanks for the tip, Lisa. Unfortunately, I couldn’t tramp a circle around our bush cherries as they are in a fence 6′ high and a bushy row. The snow just is way too deep, even at the beginning to tramp solid. Good idea for those in lower snow areas though! I know, I couldn’t around a few of mine as the drifts were to big. I also planted alliums last fall around the base of all of my new fruit trees. They look wonderful in spring (just poking thru the ground now) and maybe the “onion” scent will help. I’ve not had any chewing on two of my older trees that I established mint underneath. The mint was a trick my mom used over 30 years ago in an orchard she had. I’m trying to establish an orchard and anything that helps get thru the first three years is worth trying! We’re in central Montana and just had the coldest February ever and it will be a good test of what is going to survive here for the long term. Hi Jackie. Thanks for sharing your family and farm life with all of us out here. So fun seeing and reading about your experiences! So I see you started your tomatoes in those little expandable pucks. Do you leave that thin mesh netting on them when you transplant to a bigger container or ground? Does it restrict the roots to leave them on, in your experience? Thanks in advance! Happy Spring! Yes, I do leave the mesh netting on them. It doesn’t restrict the roots at all, unlike the peat pots do. Those I take off when I plant even though the roots are SUPPOSED to go right through. They don’t. The Jiffy Pellet netting bio-degrades over summer unlike the old version that lasted forever. Depending on how high up is “high up”, I’d guess it’s deer. They sometimes even stand on their hind legs to chew twigs. It could also be porcupine, which can cause a lot of damage on trees as they eat and eat and eat, leaving good portions devoid of bark.